Experts are of the view that Delhi’s water woes are as much due to its own poor water management and the tussle over supply. 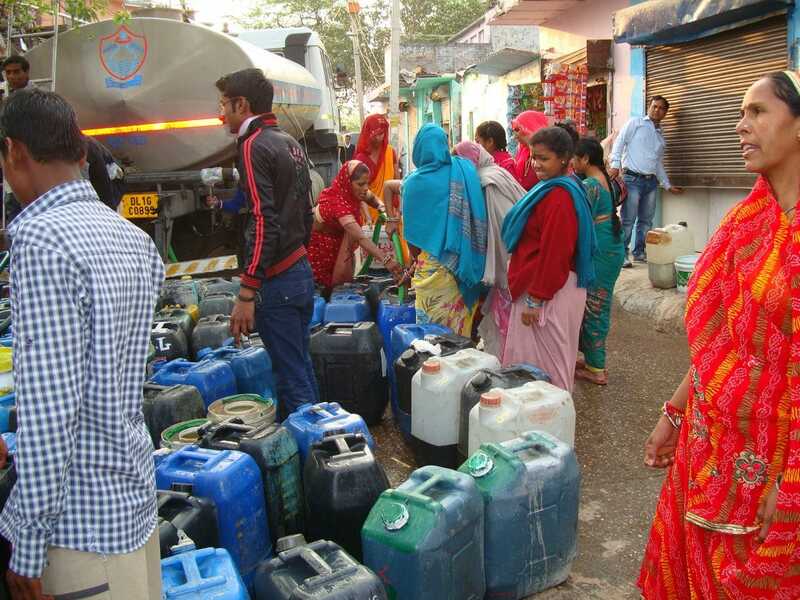 So far, the political drama over the water crisis in the city has largely centered on the bickering between officials of the two states- Delhi and Haryana. 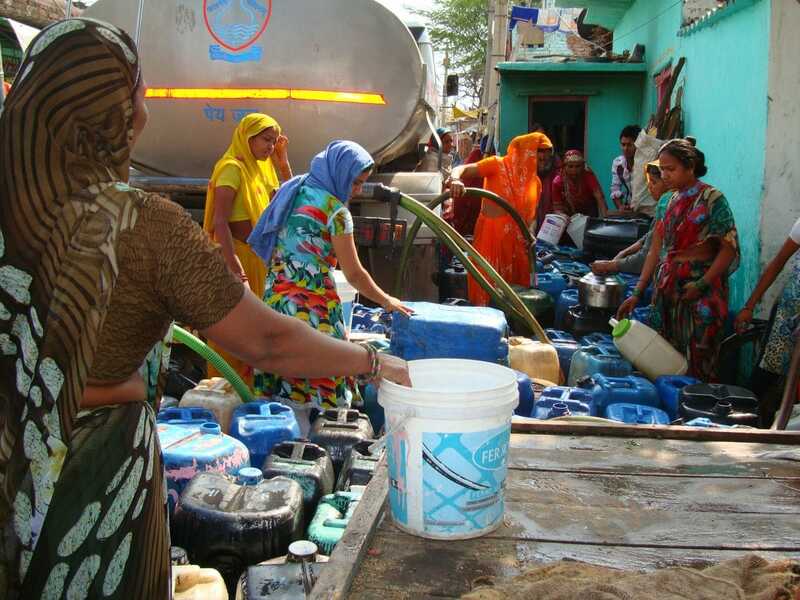 Delhi has claimed that its request to Haryana to supply its share of water has not been met. 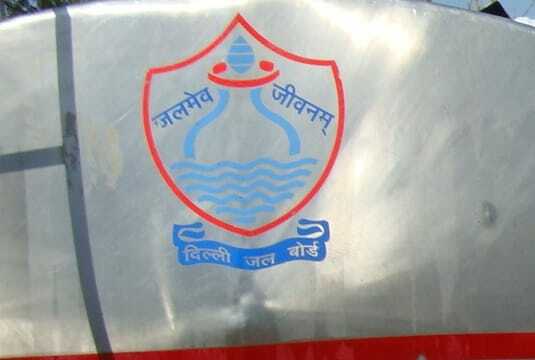 “People of Delhi are bound to face acute shortage of water as Haryana has arbitrarily and drastically curtailed raw water supply,” Delhi’s Ex Chief Minister Sheila Dikshit said in a statement previously. In response, Haryana’s Chief Minister Bhupendra Singh Hooda had said that Delhi is getting more than its due share, and that Haryana can’t be held responsible for Delhi’s wastage. This was one of the reasons that the Aam Aadmi Party ( AAP) won electoral support in Delhi may have been its pledges to provide 700 litres of free drinking water each day. The fact that they did not stay long enough in power to fulfill their promise is another story. The substantial support for Arvind Kejriwal’s party stems from the fact that 15.6% of Delhi’s urban households and 29.7% of its rural ones don’t get sufficient drinking water throughout the year, well above the all-India average, according to a National Sample Survey Organisation (NSSO) survey. 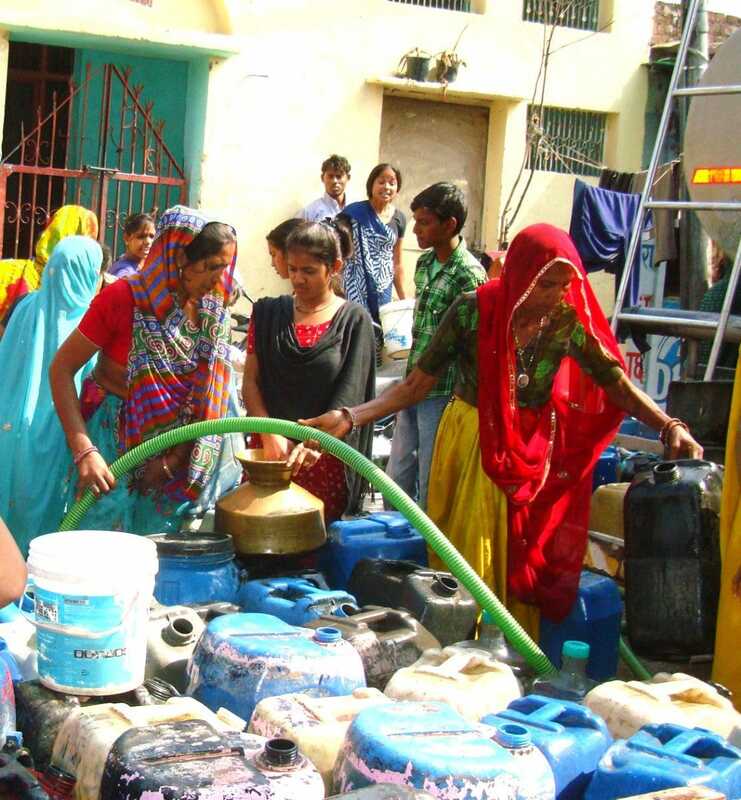 How do Delhi’s urban slum dwellers meet their water supply needs? We visited Kusumpur village, located right next to Vasant Vihar- one of South Delhi ‘s poshest neighbourhood to find out. Colourful water containers that need to be filled up. 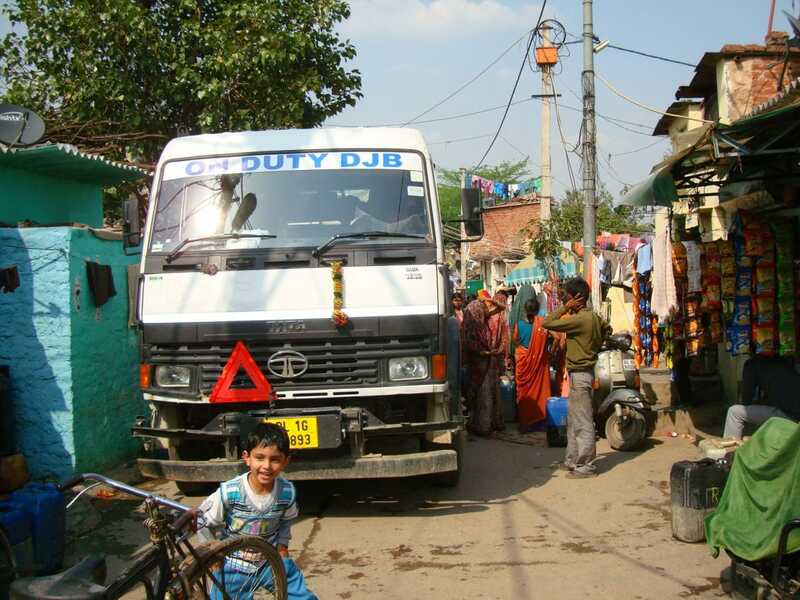 In these narrow lanes, when a water tanker arrives, it is impossible for other vehicles to pass. They just have to wait. 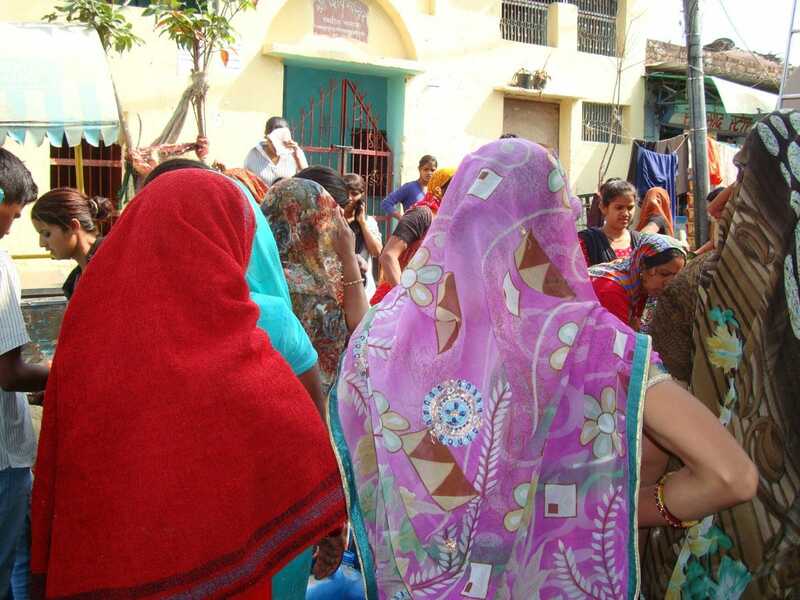 Women line up in waiting in anticipation of the water trucks. Its a mad rush, filling water is an activity that can take the whole day. “This is a daily activity”, said the woman in a red sari. “We spend all lives in this routine”. This is an activity for all the women of the house. The women bring their daughters along for help. Waiting for water is more important than sending these young girls to school. 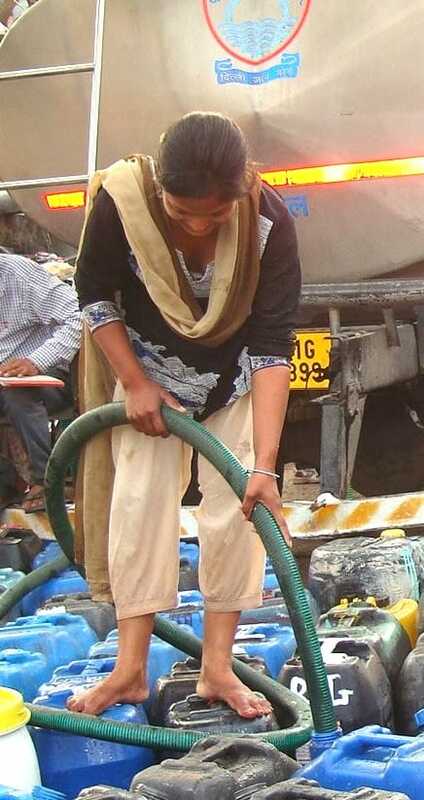 A young girl is standing on the containers to fill water. 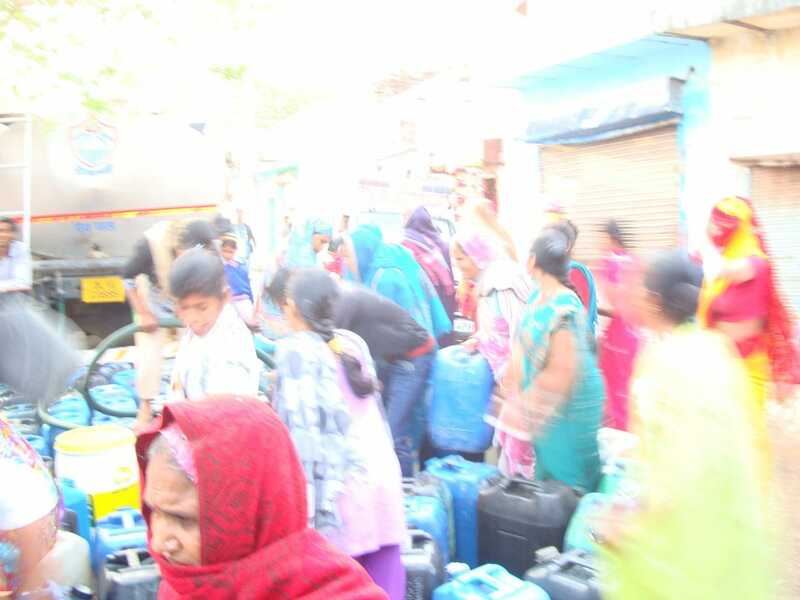 Delhi ‘s water distribution is grossly inequitable. 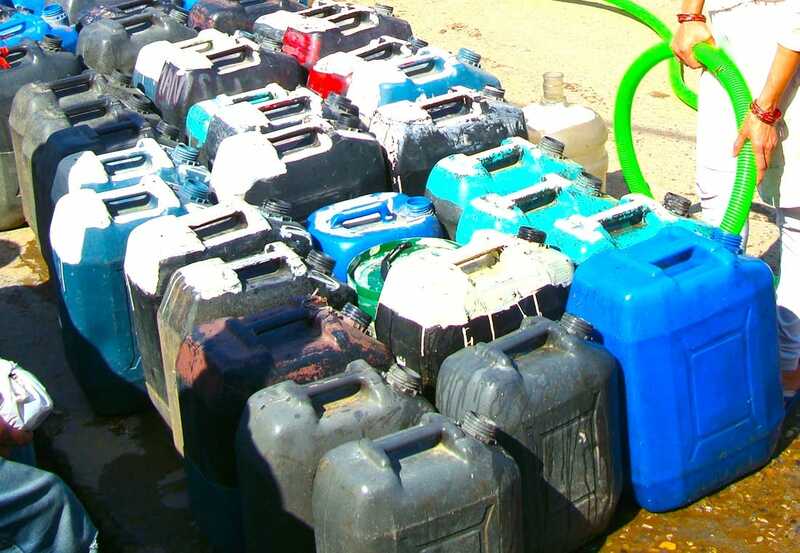 Two-thirds of the city’s population gets only 5% of the 3,600 million litres that are officially supplied, whereas the rich and privileged in get a staggering 400-500 litres per capita every day. 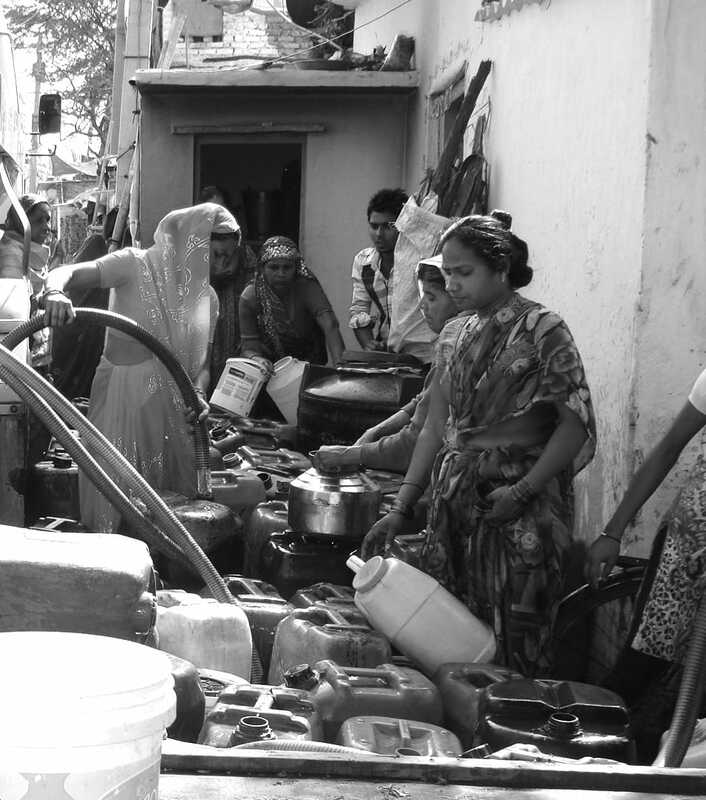 There are some 1,600 unauthorised colonies and 1,100 slums waiting to get tap water. Not only have the rich been the prime beneficiaries of subsidised water, they pay a pittance of Rs 1.6 for a cubic metre of water — the lowest in the country. 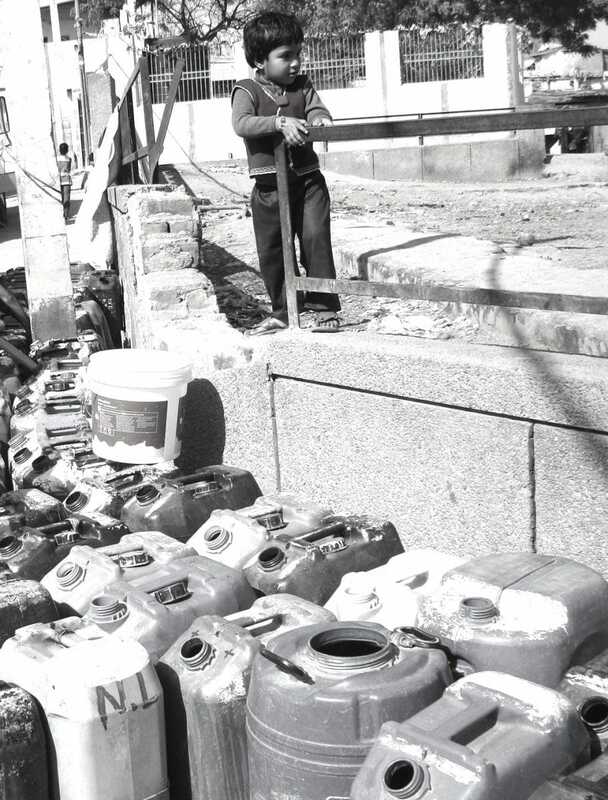 What’s more, the water crisis hasn’t deterred the city from adding new settlements. Given the fact that Delhi ‘s existing water sources have been milked to capacity, how the capital city will meet the growing demand for water remains a compelling question for both planners and politicians. 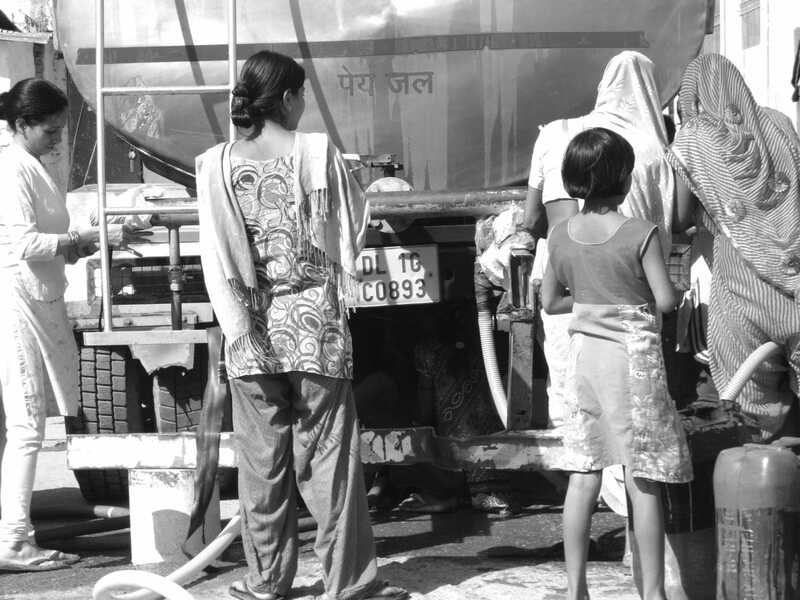 In India: Access to water has increased strongly over the past decade but a 2007 study from the Asian Development Bank reported that no major Indian city distributes clean water for more than a few hours a day. In rural areas, the contamination of rivers and wells is an increasing problem caused in part by the rapid depletion of the ground water table. We have many interesting articles which talk about the water supply problem and its impact on health.To read more, click here.